The oral tradition of Tahiti and her Islands always evokes “tahu’a” as key figures in the religious, social and cultural life of ancient Polynesian societies. With deep knowledge and mysterious powers in many areas, tahu’a were recognized, influential and respected. They were sometimes feared because no one ventured to provoke these men who clearly had powers so important that they were potentially formidable … Who were these mysterious tahu’a? Basically, a tahu’a was a man of religion who, as such, conducted ritual ceremonies, whether incantations, marriages, enthronements, intronizations of leaders or sacrifices … The role of the tahu’a was thus at the center of the old polytheistic cult in the pre-Christian era. But it would be reductive and historically inaccurate to see only a religious dimension of shamanic type, in the role of the ancient tahu’a. Similarly, the analogy with the Western “priests” is quite hazardous, even almost inappropriate. To get a better idea of the full extent of the role of Tahu’a in pre-Christian Polynesian societies, we must first focus on the etymology and semantics of the term ‘tahu’a’. Tahu’a means globally “who sees” and “who knows”. 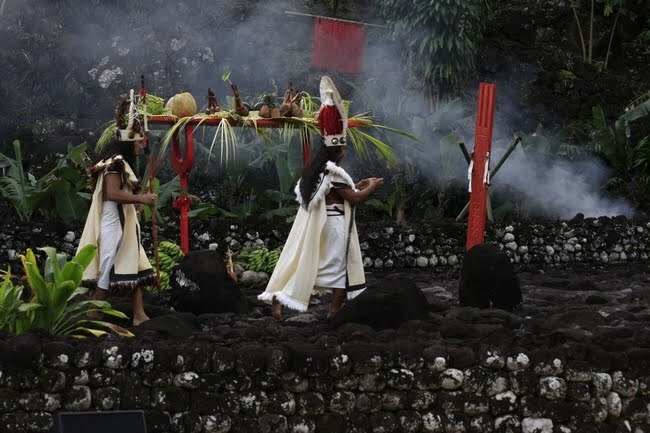 The “visionary” dimension seems to apply to their vocation as religious officiants; while the “knowledge” attributed to them by the word “tahu’a” also reveals them as men of science, humanities and culture … Thanks to their advanced knowledge in several vital domains, the tahu’a had over time developed an important level of social utility in the islands communities of the past; to the point of having become indispensable, as true guides bearing both knowledge and wisdom. In reality, not all the tahu’a were religious officiants; as in most of the cases, their social role was prevalent because of the usefulness of their knowledge in the formerly vital areas of navigation, fishing and healing of diseases and injuries. The tahu’a were generally “specialized” in one of these three areas. They initiated their successors into their art as soon as they felt that time had come to do it … Lastly, the tahu’a were playing the roles of both guides and Censors, insofar as they ensured respect and enforcement of all the rules of the community.